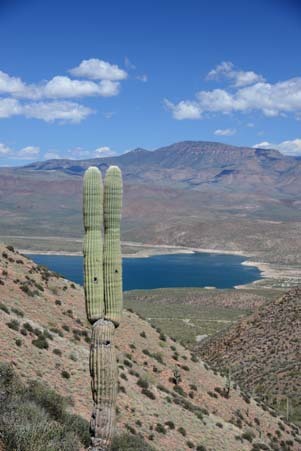 So we headed just a little further east to Roosevelt Lake where the temps are always just a few degrees cooler. 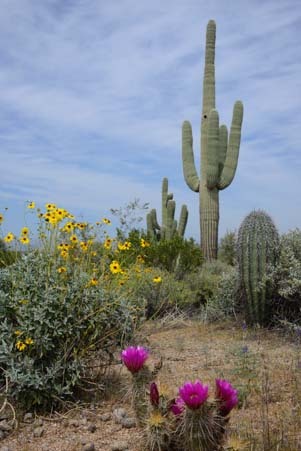 The yellow brittlebush flowers that had already run their course in Phoenix were just coming into bloom out by the lake, making for colorful images. 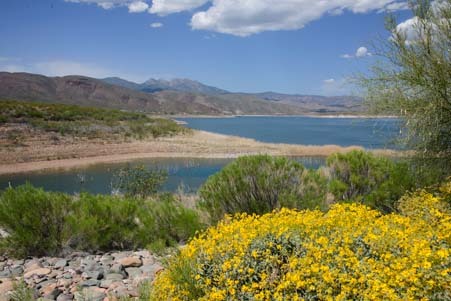 Developed campground sites have lake and mountain views. 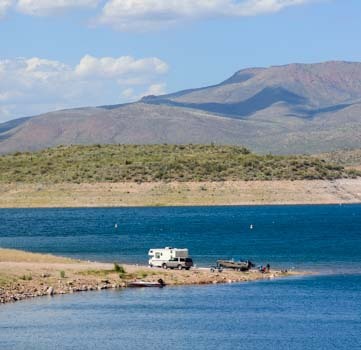 Roosevelt Lake was developed as a playground for Phoenix area residents, and it boasts several terrific waterview and waterfront campgrounds. 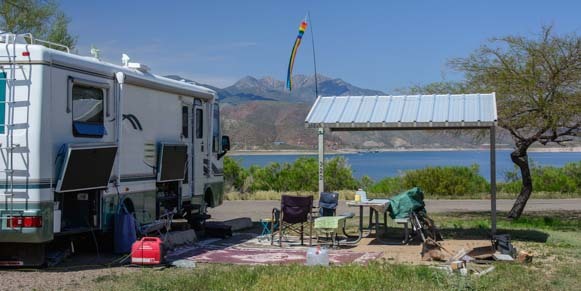 Yet, for whatever reason — perhaps because of the long distance by highway from Phoenix (although it is a short distance as the bald eagle flies) — there is such a surplus of campsites that whole loops and campgrounds around the lake have been closed due to insufficient visitors. 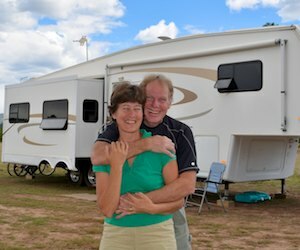 What a contrast to the Maricopa County Regional Parks system where RV snowbirds have to reserve their campsites months in advance or risk not getting a site for more than two or three nights in a row! The difference, of course, is the availability of electric and water hookups. 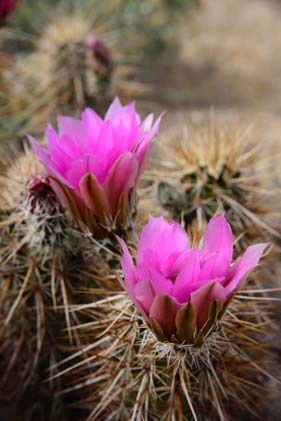 The Regional Parks charge $25 per night for pretty sites with hookups while the Tonto National Forest Service charges $6 ($3 with the Senior Pass) for beautiful dry camping sites. For those that want to camp on the beach instead of on the paved campground loops (where there are hot showers! ), there are loads of spots to set up camp right along the water’s edge for the same fee. 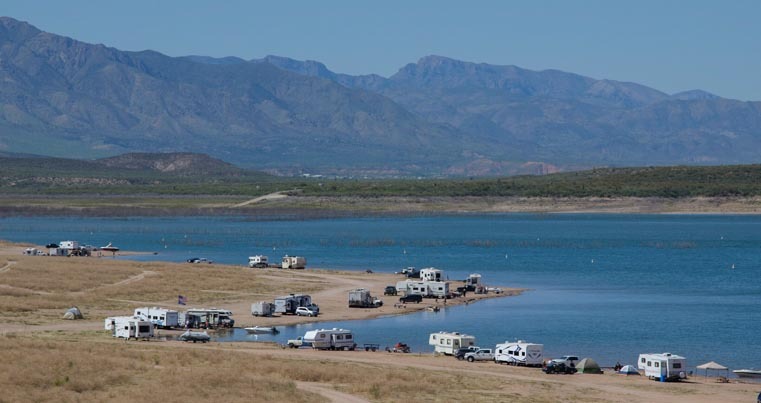 The last time we were at Roosevelt Lake a few years ago, there seemed to be a lot less boondocking along the water. Now, the water level is so low that we saw tons of people enjoying waterfront property! 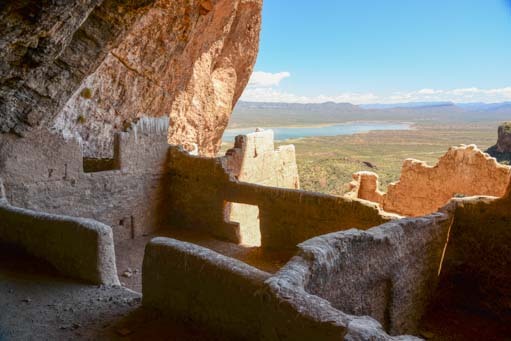 Across the highway, visitors can explore two sets of intriguing ancient Indian cliff dwellings at the Tonto National Monument. 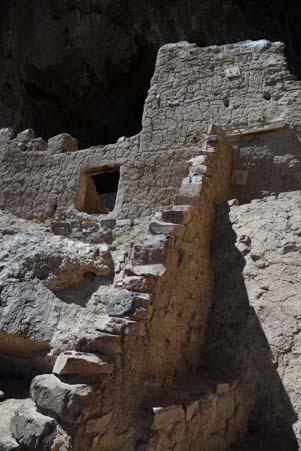 We had been to the Lower cliff dwellings years ago, so on this visit we took a “Photo Tour” of the Upper cliff dwellings. 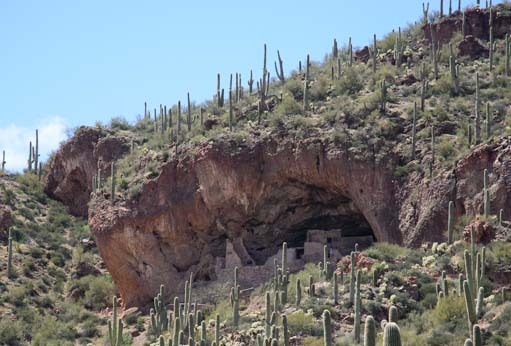 Lower Cliff Dwellings – An interesting spot to call home! This $3 tour was geared towards folks who wanted to take lots of pics. Gary teaches us a little about both photography and the Indian ruins. The tour was led by Gary and Susan Rait, retired professional photographers and NFS volunteers who happily shared their experience and wisdom with our little group of five photography buffs. 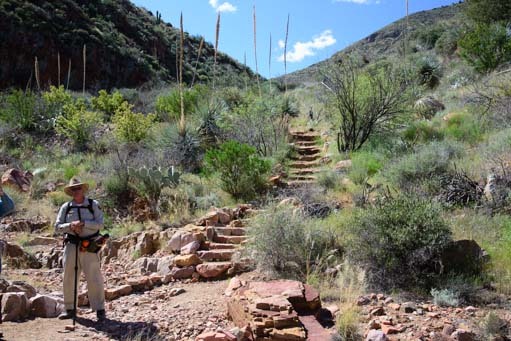 The hike up to the ruins went through a short riparian area and then the trail opened up to spectacular views of the lake far below as we approached the cliff dwellings. 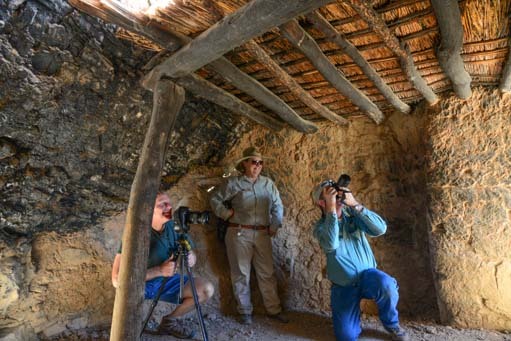 How on earth did the ancient Salado people manage to live in these aerie perches? Running up and down these steep cliffs to get between their homes and their farmlands sure must have made them strong and fit! Back at the campground we enjoyed watching and listening to the wildlife around us. 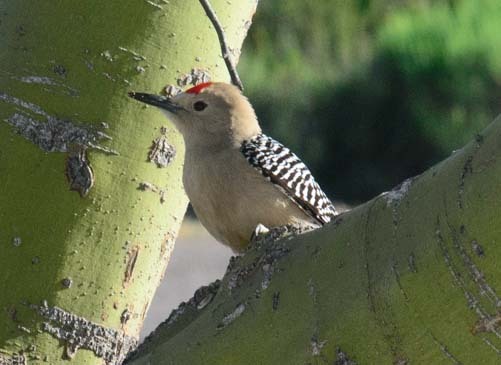 Red cardinals flitted between the bushes and a Gila woodpecker drilled away on a palo verde tree. At night we heard the hoo-hoo of an owl just outside our window. 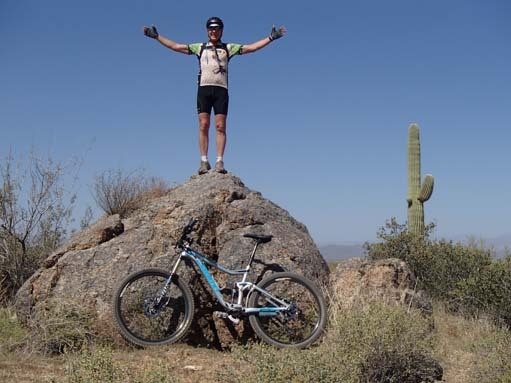 We searched the area for good mountain biking trails, and explored lots of very hilly dirt roads. 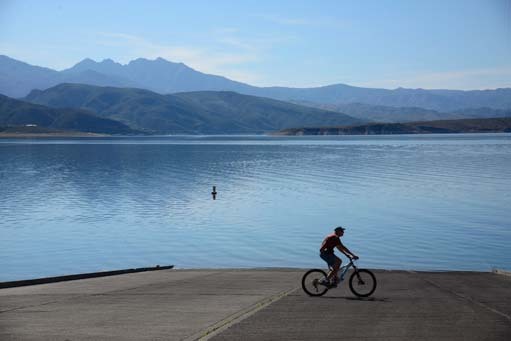 Biking on the boat ramp! The terrain was difficult, so when I turned a corner and came across Mark looking quite victorious on top of a rock, I had to get a quick pic. We rode around the campground loops too, and played for a bit on the boat launches. The water was so low that only one of several boat launches was open. The others didn’t quite make it down to the water any more! !